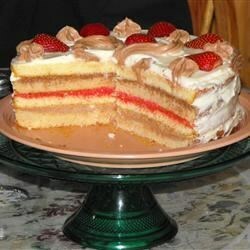 "The classic European sponge cake. No chemical leavener, just air that is beaten into the eggs. Folding (stirring without deflating) is the biggest factor. Be gentle!" Preheat oven to 350 degrees F (175 degrees C). Grease one 8 inch round cake pan. Line with parchment paper and grease it as well. Lightly flour pan and paper. Sift together the flour, 2 tablespoons sugar, and salt onto a piece of wax paper. Place the eggs into a mixing bowl set over a pan of hot (not boiling) water. Add the 1/2 cup sugar to the eggs and whisk until the mixture feels warm (not hot) to the touch, about body temperature. Place the bowl onto a mixer and beat on medium speed until the mixture becomes pale yellow in color and falls off the end of the whisk attachment in long ribbons. Add the vanilla. Add about 1/3 of the flour mixture to the beaten egg and fold in. Continue to add the remainder of the flour, folding it in each time. Place about 1 cup of the batter into the bowl containing the melted butter and combine the butter with the batter. Add this back to the main batter and fold it in. Pour the batter into the prepared pan. Immediately bake at 350 degrees F (175 degrees C) for about 25 minutes or until the top is a light brown. Cool in pan on a rack about 10 minutes and then invert onto a rack. It is best to invert it again onto another rack so that it cools with the top up. Let cool completely before cutting or frosting. I was somewhat disappointed with this cake. I am a very proficient baker, but this was not what I had imagined genoise to be. I followed the directions to a T, but ended up with a dense cake. This is it, the only cake that took me off my diet. Soft and delicious recipe used not only for cakes but for petits fours, madeleines, lady fingers and miniature Florentine squares. This is the strangest cake ever. wonderful recipe! perfect for my petits fours. Thanks!